A walk to the point last weekend, in the chill March wind, was a welcome antidote to 'morning after' fuzziness. We headed out, along with a friend who was staying with us for a short break, scrambling over progressively larger stones until we reached the sharply-spiked rocks at the eastern tip. There's a small cove just round the headland, where the waves ebb and flow through rounded pebbles. Our friend noticed that a rock to the side of the pebbles was making a strange noise, not unlike radio static. The sound was created by the sea, bubbling away through a crack in the rock. We scrambled up the hill from the shore, hauling ourselves up through the sturdy heather. 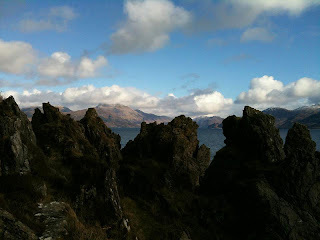 The view was worth the effort: a sweep of grandeur - all snow-capped peaks, blazing low sun, scudding clouds and steely sea. We followed a sheep track until we were heading back in the direction of home, facing west. The Cuillins rose ahead of us, way beyond the russet moor, before the view was swallowed by an incoming hail cloud. Five minutes from home the hail shower hit us: a freezing deluge, mixed with sleet and cold rain. Steaming bowls of thick lamb broth, back at the house, revived us soon enough. We sat and watched the weather close in, warming up and looking forward to another evening of good wine and good company.